Dr. Saltzman-Gabelman is board certified in internal medicine. After graduating with a bachelor of science degree from the Sophie Davis School for Biomedical Education at City College of New York, she received her medical degree from New York Medical College. She then completed a three-year internal medicine residency at Westchester Medical Center. She has been in practice in the White Plains area for more than 20 years. 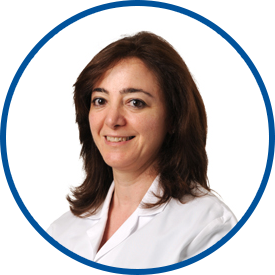 Before joining Westmed Medical Group in May 1999, she was an internist and served as chief of internal medicine for Northeast Permanente Medical Group. She is affiliated with White Plains Hospital. Dr. Saltzman-Gabelman lives in Westchester County with her husband, who is a cardiologist with WESTMED, and their two daughters. Dr. Saltzman is a superior physician in every way. I've never had an issue to complain about with her, and she has been my GP now for over 25 years. she is the best, never have any bad experience. Couldn't be happier - very thankful *Dr. Saltzman took me on as my primary last year! Dr. Saltzman is awesome! She's knowledgeable, shows compassion, empathy and genuinely cares. *Dr. Saltzman is a wonderful person and physician. Attended to all in a very professional, thorough, knowledgeable manner. In 78 years Dr. Lori Saltzman is the best Dr I have ever experienced. These care givers are very caring and loving generous people cannot desire better. Dr. Saltzman is one of the finest physicians I have ever met. She is so understanding and patient and caring. Too me, she's the best doctor ever. I have complete faith and trust in her and wouldn't trade her for any other primary care doctor. Dr. Saltzman has always provided me with excellent care and beyond. Very compassionate and thorough and listens to me always. Lori Saltzman is and has been the best doctor i could ever want. I definitely would recommend her to family and friends. Dr. Saltzman is the best! She's very thorough, informative, pleasant and patient. Dr. Saltzman has always been a good listener and explainer.